A NEW charity postage stamp released by POST Greenland on Monday 21 January 2019 will raise awareness and funds for The Salvation Army’s work with homeless people in Nuuk. Each stamp, which sells for 16 krone (US$2.40), will generate 1 krone of income for The Salvation Army. The stamp has been designed by renowned local artist Maria Panínguak’ Kjærulff, who has been the creative force behind three previous Greenlandic postage stamps. 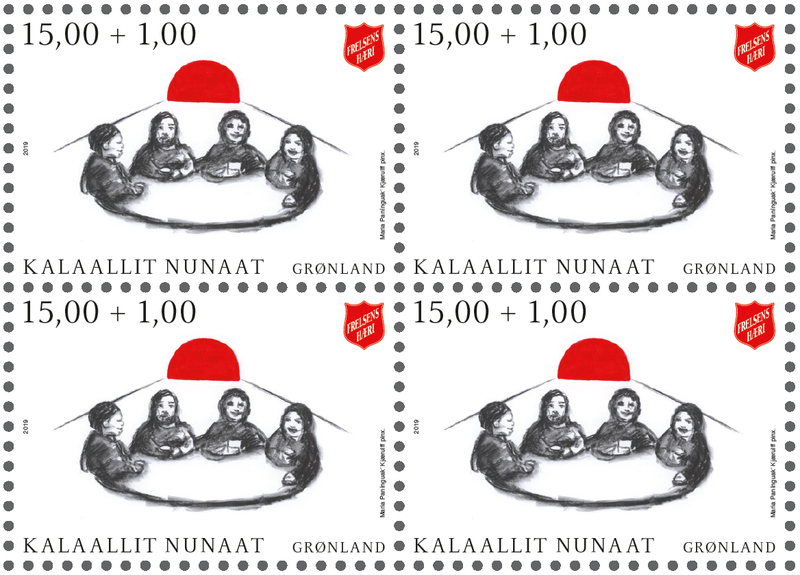 This charity stamp portrays a group of people sharing a meal around a table together – an everyday occurrence at The Salvation Army’s William’s Café in the Greenlandic capital. The design also incorporates the red ‘sun’ element of the national flag and the red shield of Frelsens Hæri – The Salvation Army’s name in Greenlandic. The theme is fitting, as The Salvation Army serves hot food daily to scores of the city’s homeless people, and works in collaboration with other agencies to provide holistic support services. The new postage stamp – which will remain on sale throughout 2019 and most of 2020 – will be officially launched at a special event at The Salvation Army’s premises in Nuuk on Monday 21 January. It will subsequently be available at branches of TELE-POST (POST Greenland’s domestic post offices, throughout Greenland) and online at www.stamps.gl for international collectors who might want to add a rare or unusual stamp to their collection. Northern Lights, a 25-minute documentary film made by the IHQ Communications team which explores the work of The Salvation Army in Greenland can be viewed and downloaded from sar.my/northernlights.